The General section contains global Cherry Framework configuration settings. Icon image that is displayed in the browser address bar and browser tab heading. Max icon (.ico) size is 32x32 px. You can also upload favicon for retina displays. Max retina icon size: 152x152 px. Enable/disable maintenance mode. Logged in administrator gets full access to the site while regular visitors will be redirected to the page chosen below. You can also preview the maintenance page without enabling maintenance mode. Select a page that regular visitors will see if maintenance mode is enabled. 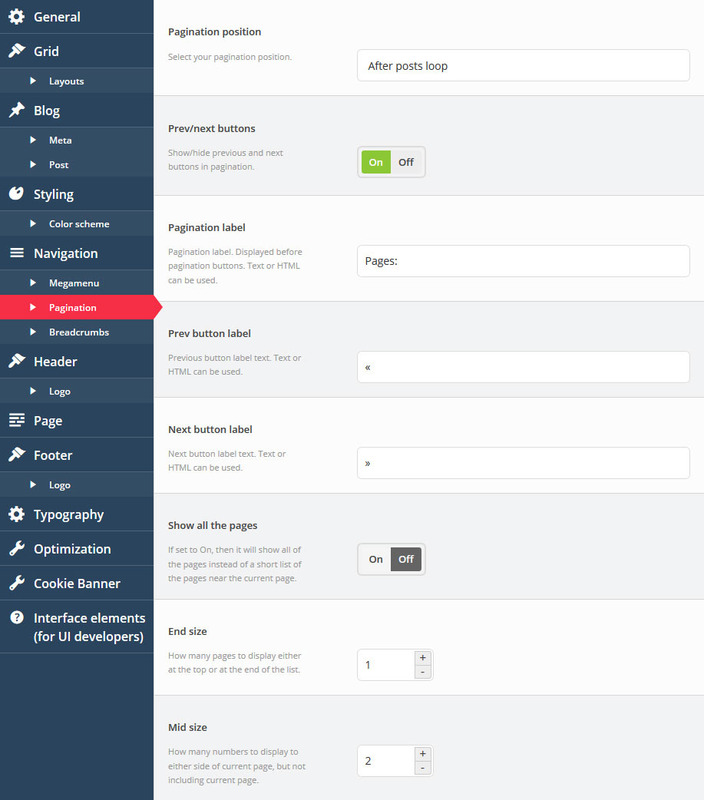 You can select any WordPress page from here, including your custom ones. Enable/disable smooth vertical mousewheel scrolling (Chrome browser only). Define the page in which will be use landing navigation. Define - display or hide "To top" button. Visual editor for crating 404 page content. Enable/disable responsive grid. If for any reason you want to disable responsive layout for your site, you are able to turn it off here. Width of the main website container in pixels. You can choose if you want to display sidebars and how you want to display them. 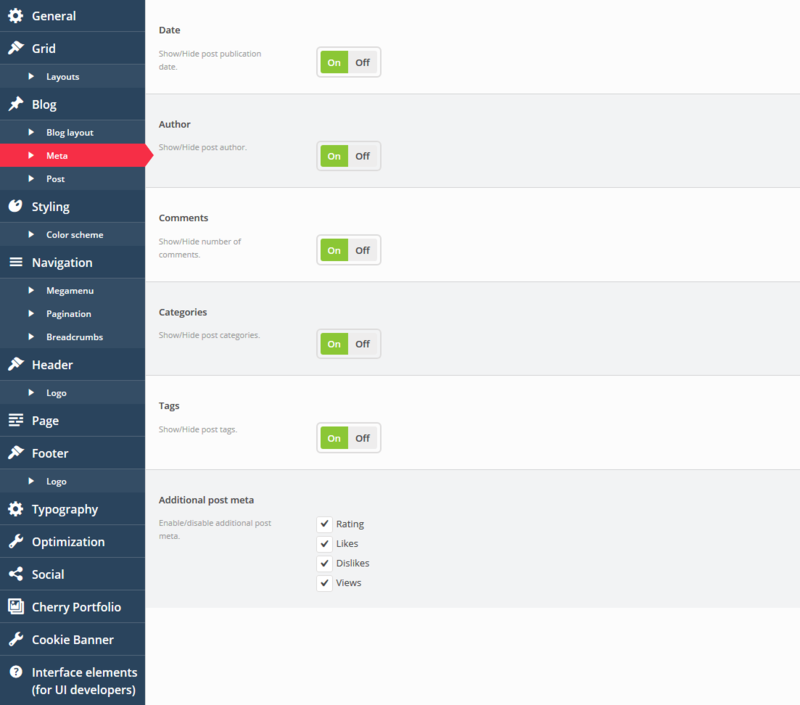 The section contains settings for WordPress blog pages (listing and single post post types). Displays Featured Image, Gallery, Audio, Video in blog posts listing depending on post type. Set dimensions for post featured images. Set alignment for post featured images. Specify the number of words displayed in blog listing content part. Will not work if post has an excerpt. Enable/Disable read more button in blog listing. Specify read the "More" button label text. Attention! 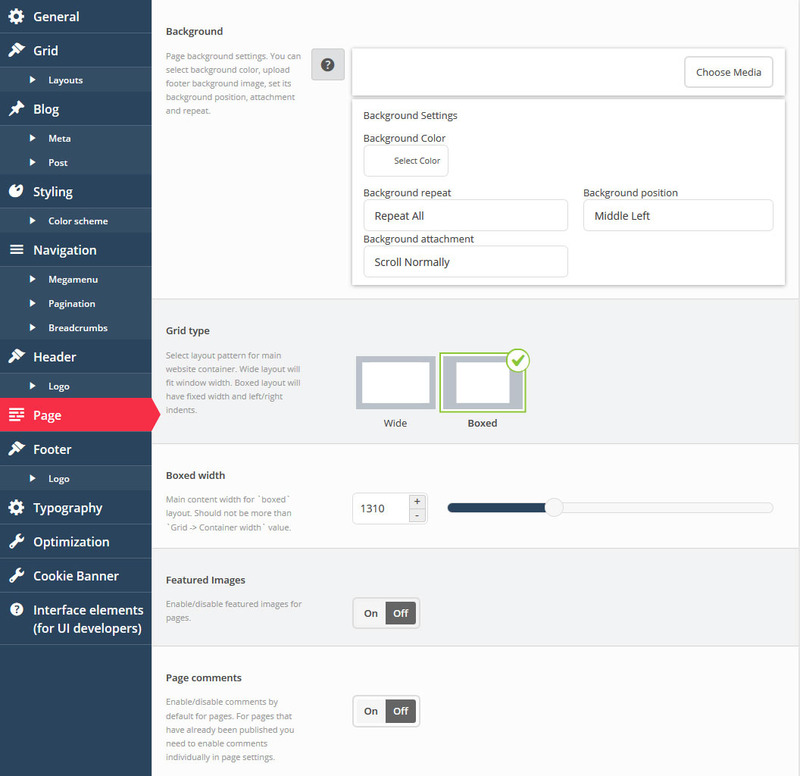 If you want to configure "Blog layout" option, you must have the "Cherry Blog Layouts" plugin installed. Select if you want to filter posts by tag or by category. Please specify pages that will use custom blog layout. Select grid layout pattern for pages with custom blog layout. Specify custom masonry layout columns number. Specify custom masonry layout columns gutter(px). Specify custom item width for Timeline blog layout(%). Select layout pattern for pages with custom blog layout. Wide layout will fit window width. Boxed layout will have fixed width. Select template type for blog posts. Attention! If you want to configure "Additional post meta" option, you must have the plugin - "Cherry Blog Layouts" istalled. Display featured image on the single post page. Set dimensions for single post featured images. Set alignment for single post featured images. Enable/disable author bio block. Author bio block is displayed on the post page. Enable/disable related posts block. Related posts block is displayed on the post page. Enable/disable comments for blog posts. 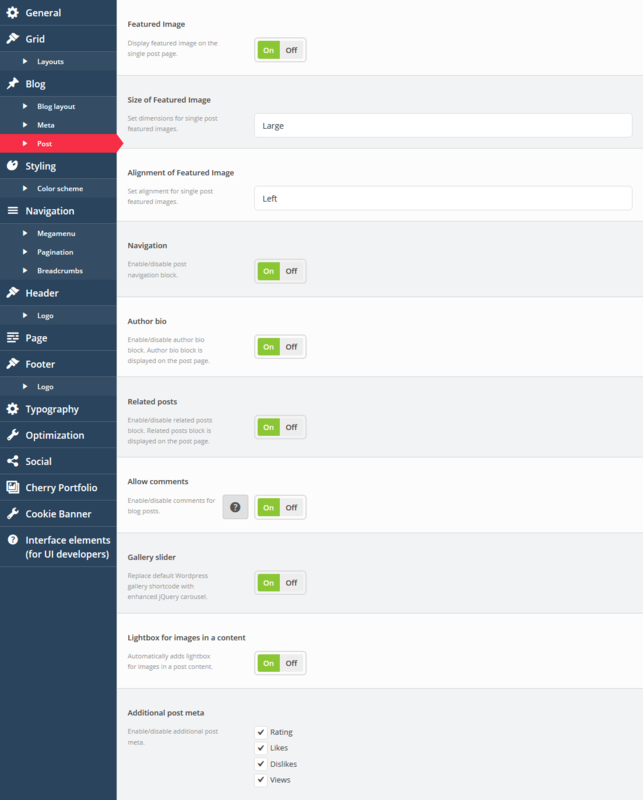 Replace default Wordpress gallery shortcode with enhanced jQuery carousel. Automatically adds lightbox for images in a post content. 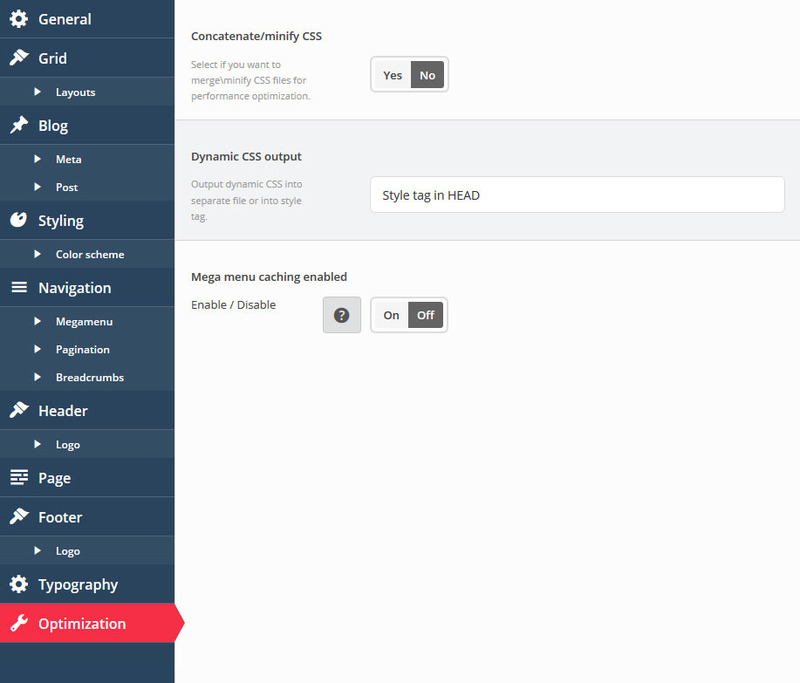 The section contains theme styling settings. Here you can edit the main theme colors. Set the background for body container. You can specify background image or color, set background repeat, position and attachment. 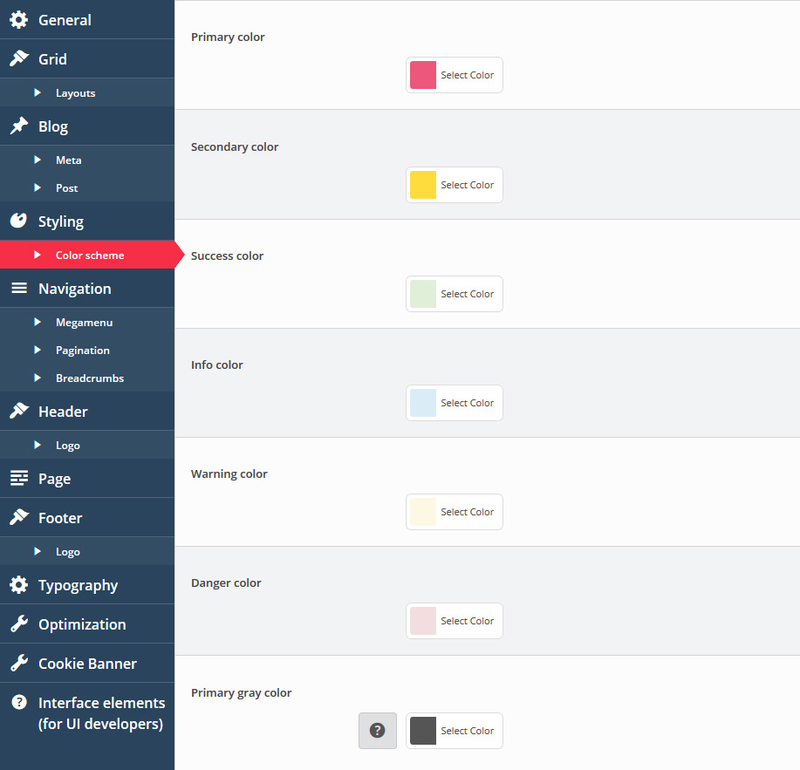 Changes colors for various theme elements like forms, typography elements, blocks with default styling, etc. Define website navigation settings. 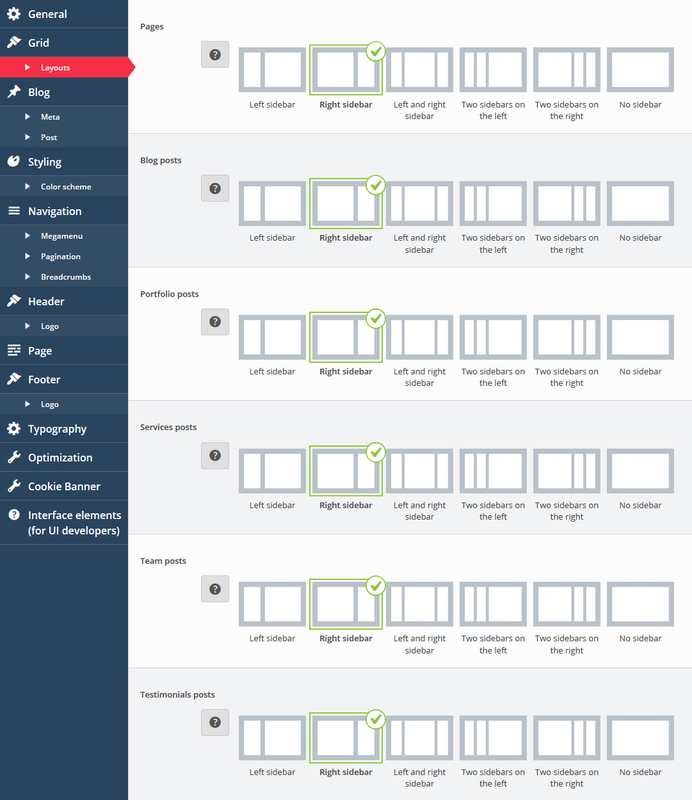 Menus typography and colors, pagination and breadcrumbs settings. 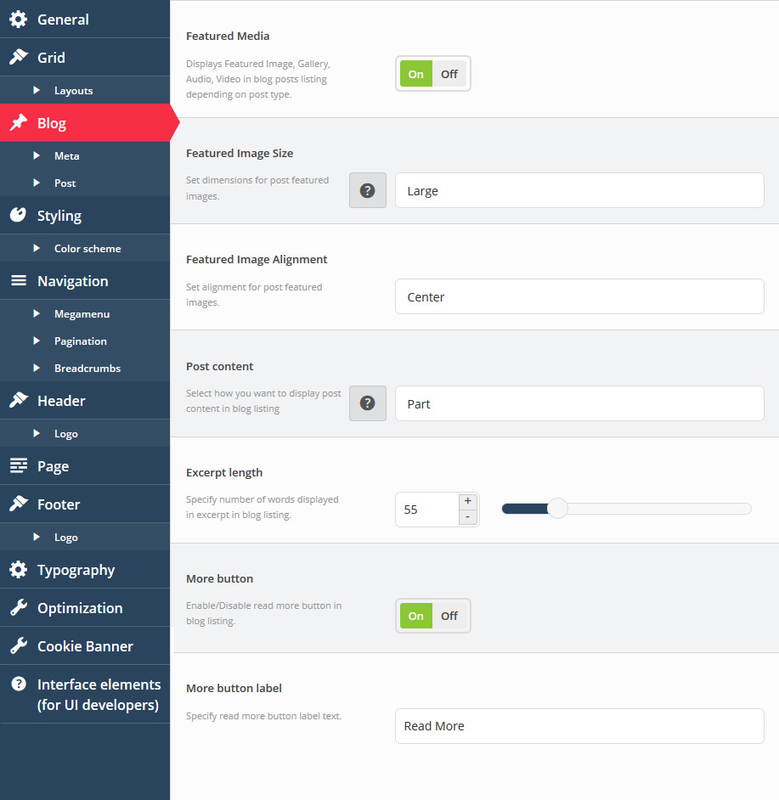 The main header navigation typography settings. You can configure menu font and color. 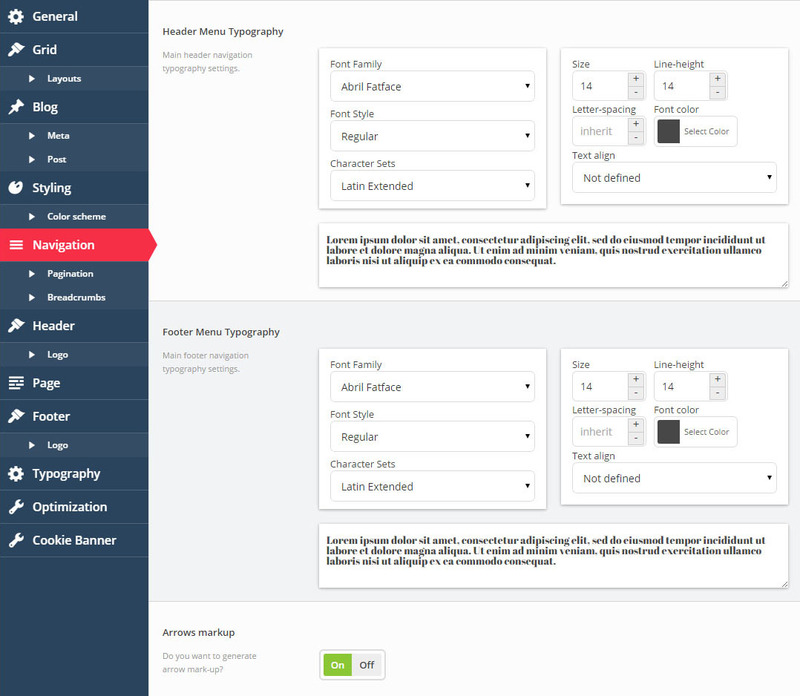 The main footer navigation typography settings. You can configure menu font and color. Do you want to generate arrow mark-up? Select where you want to display pagination. Show/hide previous and next buttons in pagination. Pagination label is displayed before pagination buttons. Text or HTML can be used. Previous button label text. Text or HTML can be used. Next button label text. Text or HTML can be used. If set to On, it will show all of the pages instead of a short list of pages near the current page. How many numbers to display on either the start or the end list edges. How many numbers to display to either side of the current page, but not including the current page. Enable/disable page title in breadcrumbs. Enable/disable breadcrumbs on mobile devices. Enable/disable breadcrumbs on the home page. Text displayed before the breadcrumbs navigation. 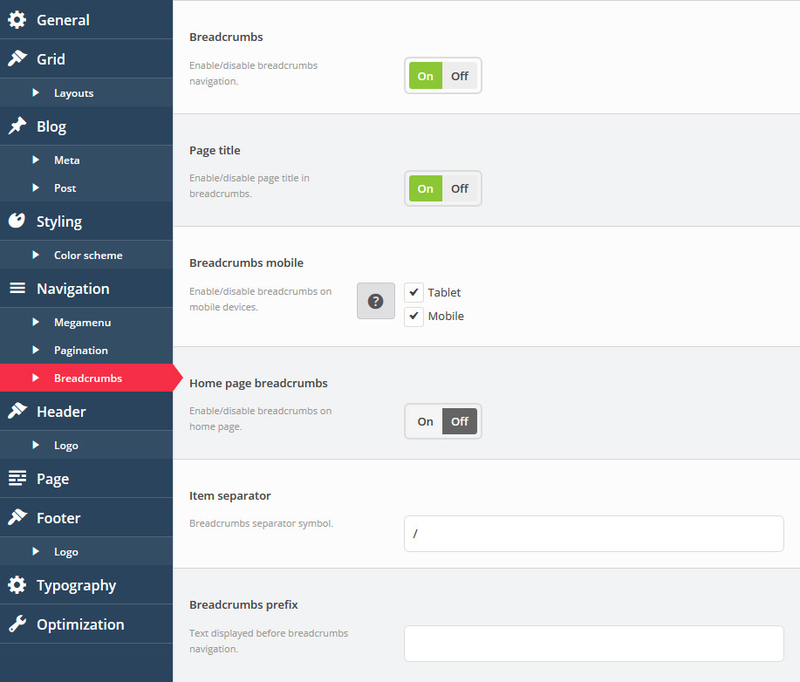 Settings for the website header section. Logo, background, sticky header, etc. Header background settings. You can select the background color, upload the header background image, set background position, attachment and repeat. Select the layout pattern for the website header. Wide layout will fit the window width. Boxed layout will have fixed width. Header section width if boxed layout is active. Should not be more than the Grid -> Container width value. Select the block selector that will be used to build sticky panel. You can use tag name, class name or id. Select whether you want your main logo to be an image or text. If you select 'image,' you can choose a logo image from the media library in the next option, and if you select 'text,' your WordPress Site Title will be shown instead. Click the Choose Media button to select the logo image from the media library or upload your image. Configuration settings for text logo. Here you can select the logo font family, size, color, etc. Page background settings. You can select the background color, upload page background image, set the background position, attachment and repeat. 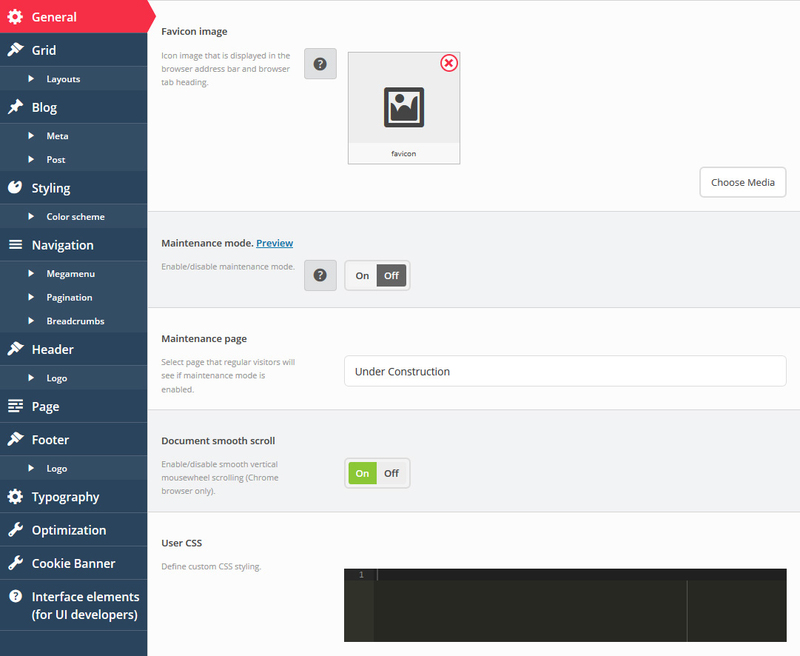 Select the layout pattern for the main website container. Wide layout will fit the window width. Boxed layout will have fixed width and left/right indents. Header section width (if boxed layout is active). Should not be more than the Grid -> Container width value. Enable/disable featured images for pages. Enable/disable comments by default for pages. For pages that have already been published, you need to enable comments individually in page settings. Footer background settings. 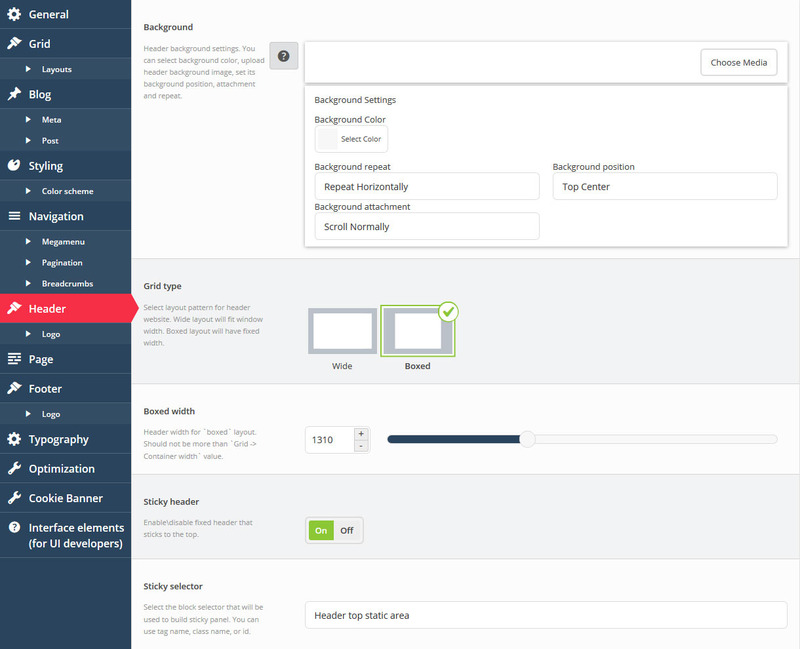 You can select the background color, upload footer background image, set the background position, attachment and repeat. Typography settings for footer texts. Select the layout pattern for website footer. Wide layout will fit the window width. Boxed layout has fixed width. Set custom text for your Footer area. Select whether you want the main logo to be an image or text. If you select "image", you can choose a logo image from the media library in the next option. The "text" type displays the WordPress Site Title instead. Configuration settings for text logo. Here you can select the logo, font family, size, color, etc. 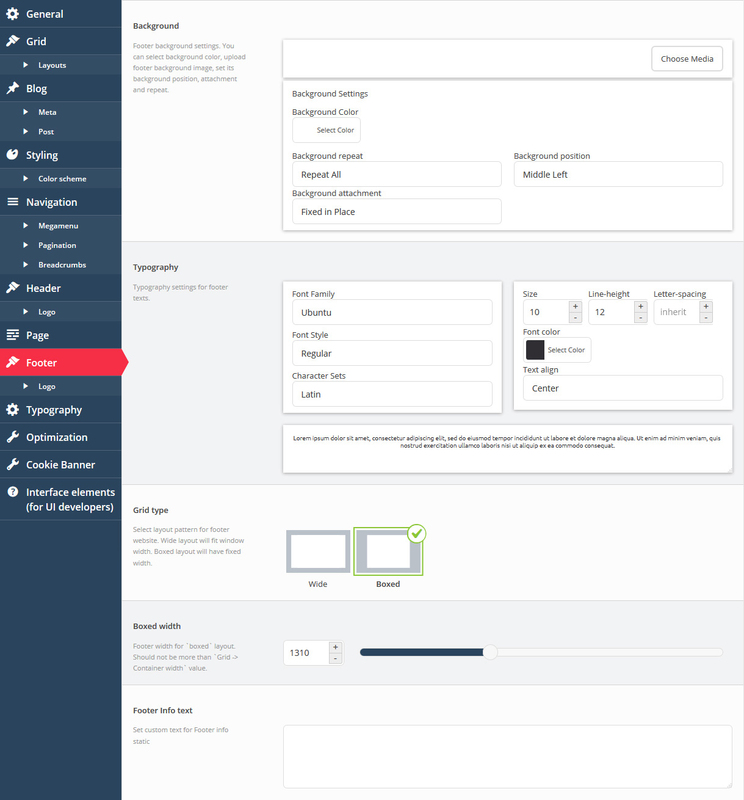 Theme typography settings. You can configure all aspects of website typography, fonts, colors, etc. Color for links on hover. Styling of the text in forms. Styling of the text in breadcrumbs. Define custom Font style and Character Sets for selected web font. Select if you want to merge or minify CSS files for performance optimization. Output dynamic CSS into a separate file or into style tag. 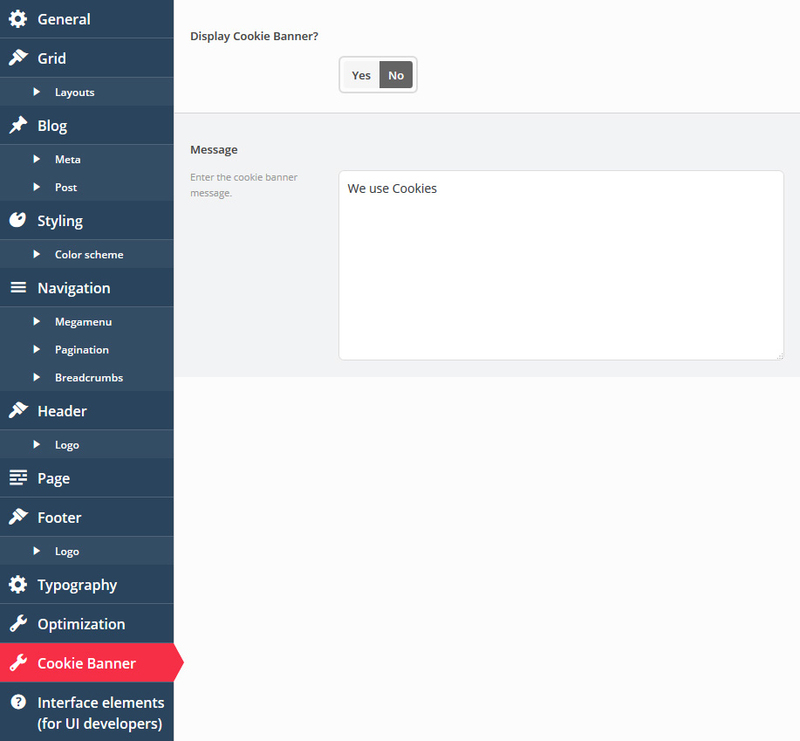 Specify if you want to display cookie banner. Enter the cookie banner message.